Spa hose simplifies plumbing layouts and installations by replacing PVC pipe on hot tubs and spas. It will readily form to desired contours without using elbows. Unlike other hose, Spa Flex is measured by nominal pipe size as its OD is identical to the OD of PVC pipe to accommodate slip-on style glue fittings (when attaching PVC fittings, use PVC-to-flex cement). This hose meets FDA and IAPMO plumbing requirements and is resistant to sun, ozone, weathering, and mildew. We offer two brands, standard NL2360- and a premium NL2361- that is made from virgin resin and high quality DOP plasticizer to ensure long life and is resistant to sun, ozone, weathering, and mildew. Typical Fittings: Standard schedule 40 glue-on PVC slip fittings. 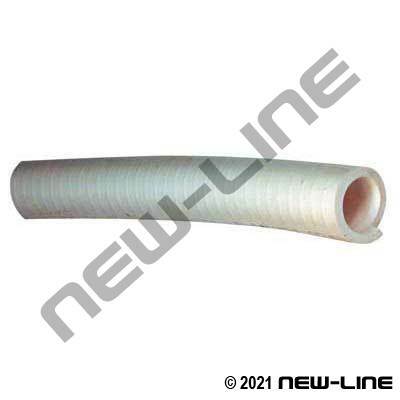 Construction: Tube: Smooth, white PVC. Cover: Smooth, white PVC. Reinforcement: Rigid helix.